Is Red Tea OK While Pregnant? The flowers and roots of the red clover plant, a common weed which grows abundantly throughout North America and Eurasia, have been used for centuries for medicinal purposes. According to the National Center for Complementary and Alternative Medicine, healers have traditionally turned to red clover as a treatment for respiratory ailments such as bronchitis, asthma and whooping cough. In modern naturopathy, red clover is used to treat menopausal problems, high cholesterol, osteoporosis and menstrual abnormalities. Despite its folk use as a fertility enhancer, red clover is unsafe for use during pregnancy. Red clover exerts a multi-faceted effect on the human body, and its exact effects on pregnancy are under-researched and poorly understood. Red clover contains compounds known as isoflavones, which increase the production of estrogen in the human body. Estrogen regulates a number of activities involved in a woman's body including ovulation, menstruation, pregnancy, childbirth and lactation. Red clover can influence these activities, possibly leading to complications during conception, pregnancy and childbirth. No studies have evaluated red clover's safety as a fertility enhancer. However, red clover may treat the hormonal imbalances related to menstrual problems. According to the University of Maryland Medical Center, red clover's estrogenic effects may also reduce menopausal symptoms and osteoporosis during a woman's post-fertile years. Red clover is associated with few side effects when it is used cautiously by non-pregnant women. The most common complaints associated with red clover include headaches, nausea, digestive complaints and mild skin rashes. Additionally, red clover may paradoxically harm a woman's fertility. Some animals become infertile after grazing on large amounts of red clover blossoms. 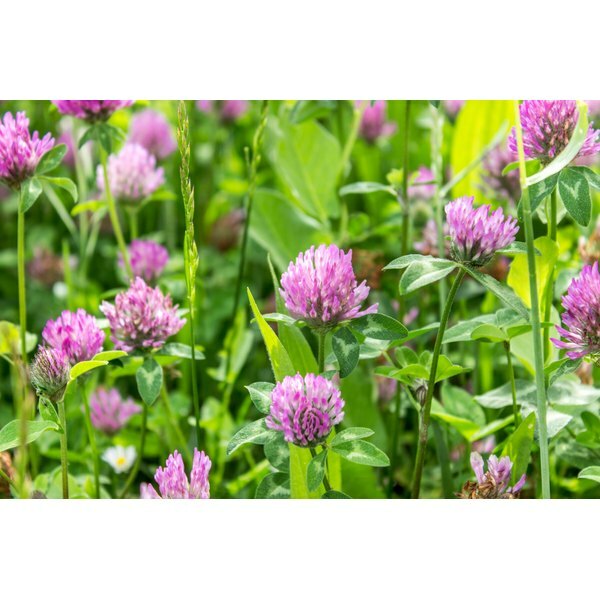 There is no dose of red clover that is known to be safe for pregnant women; it is best to avoid the product entirely during all stages of gestation. However, common doses of red clover include 2 to 3 cups of red clover tea or 40mg of dried clover blossom daily. It is particularly important to avoid tinctures made from red clover; these ethanol-based extracts can cause fetal alcohol syndrome due to their high alcohol content. Because no studies have evaluated the safety of red clover during pregnancy, most of its risks are considered to be theoretical. Red clover may stimulate contractions of the uterus, leading to miscarriage or preterm birth. Additionally, the herb could cause changes in a baby's developing endocrine system, leading to abnormal formation of the reproductive organs. Red clover's estrogenic effects may also interfere with lactation, leading to difficulties with breastfeeding after the baby is born. What Happens if You Don't Have Enough Vitamin B6? Should You Eat Raw Conch While Pregnant?